Ding-ding-ding... it's 5 AM and the alarm is sounding. It's time to get underway with another long day of truffle harvesting. Unlike myself, the dogs are beside themselves knowing that we are doing something today. The car is packed and something is afoot. By the time I have sorted and exercised those dogs which are not taking part in this particular day’s activity, it is almost daylight. It's just one of those jobs that takes place in the winter and during the shortest days of the year. In typical truffle fashion, it is overcast and foggy with rain having fallen during the night. It is much better than when we have a heavy frost, as this tends to keep the scent down and makes the dog’s job a lot harder. Of course lots of rain is not much fun either, besides getting soaking wet it makes the job tough, as well, trudging up and down those truffiere’s with your feet slipping all over the place. "We teach the dogs to scratch the surface of the ground when they have found the correct scent, thus marking the place where the truffle is." We have only one job today; 1,000 trees for a person who would like to harvest the traditional way - using pigs. As yet the pigs have not found any truffles, so we have been called in to see if the pigs are working. No... that’s a little bit of pressure for you. At least if we don’t have any luck, we can compliment them on the good job that the pigs are doing! At Aussie Truffle Dogs, we like to work our dogs in teams as doing so helps them with this, the most demanding discipline of scent work. Once they have been working for about one hour, you can see them loosing concentration, so we swap to another dog and rest the first one. The amount of water that the dogs will consume is rather large. We have packed 2 X 5 litre containers and are taking along four workers. Although the day is overcast, the dogs find this work extremely thirsty. We have estimated that we will cover approximately six kilometres in order to check each individual tree in the truffiere. At last, Shaye arrives. We load up into one vehicle, set the Tom Tom Navigation system and head off. We have to travel three to three-and-a-half hours to get to our destination, so it will be a full day for the team. Traffic is light. The fog soon clears and we have a rather overcast day. It is quite steep heading up the last few kilometres to our destination and I can already feel the pull in my calf muscles. We received a warm welcome and there is great excitement. All the children and grandchildren have assembled for the harvest. The property is in a dairying area but the owners have changed to beef in the last few years. I have to admire this family who have planted out ten hectares in the hope that this will be a viable crop and will encourage the next generation to stay with the land that has been in their family for a long time. This just adds to the pressure, we really would like to find some truffles for this family. The paddock is divided into two with a creek cut out at the bottom of each section. There are 400 trees in the first section, so we plan to get these out of the way before lunchtime. First up is Kinae, who is a little on the small side for a field spaniel, but she is aptly named the "pig dog" as she is quite vocal with her scenting prowess. Shaye starts with Operah. We first place the dogs into a harness; the only time they are in harness is when they are training or working a truffiere. We have plenty of bait/food rewards and some blinds, which we use intermittently so that the dogs have a find and receive their rewards. An hour later we have knocked over the first section then we proceed around to the other side to park the Ute. We place a blanket over the sides so that the sun cannot beat in on the dogs. We have a built-in barrier and divider that allows us to leave the back open, so that they are cool. Even though it is not a hot day, we like to give them plenty of air and a nice quiet time before we get into the next 600 trees. The quad bike is really overloaded taking five of us up the very steep incline to the house for lunch. In typical Aussie fashion, we are fed on sausage rolls, with home made chilly sauce or just tomato sauce, if you prefer, all washed down with a tea or coffee, depending on your preference. 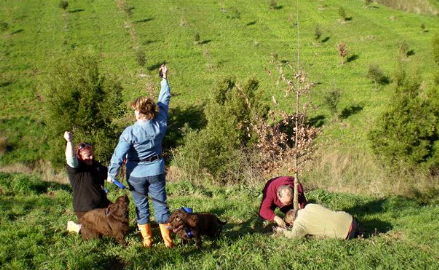 I don’t think that I have ever met an owner who was more confident about having truffles: "You just need to find them; I have no doubts that we can grow them!" It is really quite a secretive industry, so we don’t ask too many questions. The trees have been in about five years and the dogs just need to give them the once over, in case those pigs are not actually doing their job. The brule (a natural die-back under trees, indicating that the trees have mycorrhizal formation, which is indicative truffles) was better in the top paddock, so we were still hopeful of finding something. The second paddock was equally as steep as the first and I was working up quite a sweat. I was beginning to loose hope with each completed row. Late in the afternoon, we were down to the last few rows and I thought, "Well there is no truffle here." The boss and I were chatting as Shaye and Operah were completing the last trees. I had just launched into my prepared speech on "How the pigs were obviously working well" when Shaye yelled, "George can you bring Kinae down to check this tree, please?" We had worked for almost four hours without the dogs marking anything but the blinds that we placed out for them. We teach the dogs to scratch the surface of the ground when they have found the correct scent, thus marking the place where the truffle is. Kinae was quite excited and marked the spot that Operah had. In comes the boss to see if there is anything there. A little of the dirt surface is removed and the boss gets down onto his hands and knees to smell for the truffle scent. He looks up and says, "Yep, definitely truffle!" I thought that he was joking. But he handed me a handful of soil and sure enough, there it was; the unmistakeable and pungent truffle aroma. They dug down a bit more until they found a root about the thickness of your thumb and underneath, or almost wrapped around it, was a truffle. Well, Shaye and I pumped the air like Leighton Hewitt, and shouted out. The boss’s wife, who was standing at the top of the hill, happened to snap a photo at the exact right time. The truffle was partially rotted, but weighed in at 100 grams. They used this to fine tune the pigs and found another three truffles during the remainder of the season. It is a real high when you have worked hard to get your dogs trained then get out and find the very first truffle for someone. I know the amount of work that goes into setting up and maintaining a truffiere. I am not sure how I will react when the first truffle is found from our own truffiere. Georgie Patterson has been involved with field spaniels since 1990 breeding Grand Champions, Champions and Best in Show winners. She has donated dogs to work as assistance dogs with the disabled. Georgie has been working in scent detection for three years now and her focus will continue in this area and her involvement with Aussie Truffle Dogs, rather than confirmation showing.